According to a report published in December 2015 by Transparency Market Research, the global BIM market was worth $2.76 billion in 2014 and is expected to reach $11.54 billion by 2022--a CAGR of 19.1%. 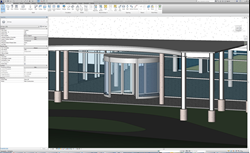 Boon Edam Inc., a global leader in security entrances and architectural revolving doors, today announced that its entrance solutions are now available to architects, designers and contractors as Building Information Modeling (BIM) files on the Autodesk Seek library at seek.autodesk.com. Boon Edam Inc.’s BIM files have also been updated and optimized for use with Autodesk Revit software in North, Central and South America. BIM is an intelligent, model-based process that helps make design, engineering, project, and operational information more accurate, accessible and actionable for buildings and infrastructure projects. Project teams can create and share a data rich model and use the same consistent data to improve understanding and decision making from conceptual design through construction documentation and for operations and maintenance. BIM also helps in attaining estimates of various other factors, such as cost implementation, time and labor requirements, raw material provisioning, and other key construction industry prerequisites. Management of the entire construction lifecycle, from planning to demolition, can be simulated by BIM. According to a report published in December 2015 by Transparency Market Research ("Building Information Modeling (BIM) Market - Global Industry Analysis, Size, Share, Growth, Trends and Forecast, 2015-2022), the global BIM market was worth $2.76 billion in 2014 and is expected to reach $11.54 billion by 2022. This represents a CAGR of 19.1% through 2022. The report also found that North America was the largest market for BIM in 2014.The full report can be accessed here. Designers who use Boon Edam’s BIM files can simply select a product and download the family file (.rfa) into their own network folder. The user can then easily choose a revolving door of a certain size and drag and drop it into a wall of the building model. Optical turnstiles can be dropped into a floor position. All products can be shown in plan view or 3-D view and offer detailed company, product and specification data. Optical turnstiles can be challenging due to the different types of cabinets needed to build an array correctly. Boon Edam’s BIM files solve this challenge by providing a simple array of turnstiles by default, which can then be easily modified by changing the number of standard lanes and wide lanes. A handy library of available finishes or colors, as well as glass or barrier options makes customization possible in just a few clicks of a mouse. Boon Edam Inc. will offer a support service dedicated to answering questions about accessing and manipulating its BIM models. Customers can contact sales@boonedam.us to use this special service. Autodesk and Revit are registered trademarks of Autodesk, Inc., and/or its subsidiaries and/or affiliates in the USA and/or other countries.